The idea of vegan cheesecake is nothing new and we owe it to the brilliant creator who experimented using cashews in place of dairy for that thick and creamy consistency of all that is cheesecake. Normally I shy away from cashews and high fat desserts/food in general but we have to live a little (or we’ll go crazy!) and with special occasions such as Thanksgiving – a day that’s cumbersome enough for vegans – I’d say it’s a perfect holiday to thoroughly enjoy and be grateful for all the yumminess available to us. 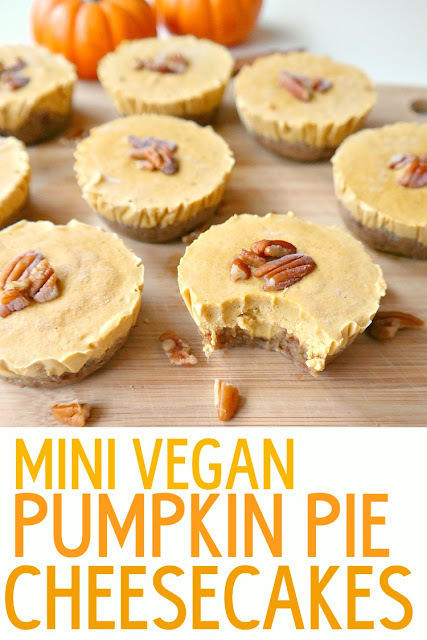 Share plant based desserts like these Mini Vegan Pumpkin Pie Cheesecakes with family and friends. Show them how delicious this way of eating can be. Eat mashed potatoes with vegan butter because it’s comforting, not because it’s fattening. I love these Mini Vegan Pumpkin Pie Cheesecakes because they’re the perfect little treat for fall parties or just to have something sweet on hand. Simple, rich, pumpkin-spiced, creamy and not too sweet, they hit the spot and give you the comforting feeling of all things Fall. Start by soaking the cashews for one hour and soaking the dates for 10 minutes. Line a muffin tin with plastic wrap or liners. Make the crust in a food processor. Blend the pecans until ground, then add the soft dates and sea salt. Pulse until well combined and sticky. Transfer the mixture into muffin tin and press down until a crust is formed. The crust is super sticky and it helps if you run your fingers under warm water before pressing down the crust. Place tin in freezer for 15 minutes. In a high speed blender, blend all the ingredients for the filling until smooth and creamy. Remove tin from freezer and pour the filling over crust. Top with a few extra pecans and freeze for about 4 hours, or until firm. 0 Response to "mini vegan pumpkin pie cheesecakes"